I have fond memories of my Great Grandparents. When I was very young, maybe 4 years old, my G-Grandparents managed and lived in a large apartment building in Detroit. I remember going into the apartment basement with Papa Fred and watching, fascinated, as he shoveled coal into the huge furnace. Once when I was in the basement with Papa Fred the coal delivery truck came. I remember hearing the diesel motor and gears grinding and then coal came crashing down a shoot into the basement bin! And I also remember the casts of Dandelion Wine stacked in a dark corner and Papa Fred showing me the golden yellow liquid inside. I remember Grama, always dressed in a "housedress" and apron, telling me about eating puff balls and picking wild mushrooms and huckleberries. I remember her livingroom with the fancy table lamps and the big windows that I could sit at and look way down at the traffic on the street. 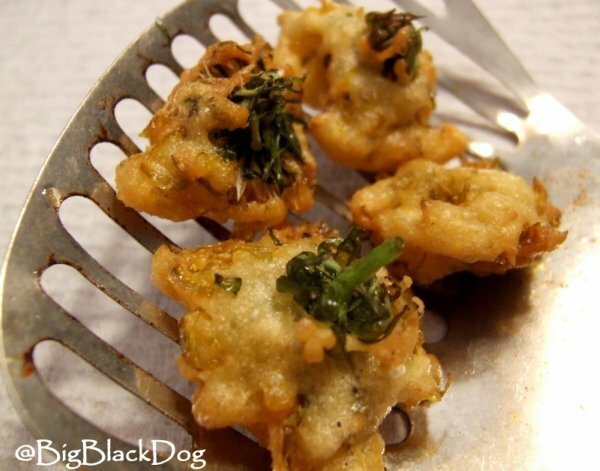 And I remember Grama telling me about frying dandelion blossoms. Mix up milk, flour, corn meal, salt, pepper, paprika and garlic. You can add a bit more milk if the batter is too thick. Holding the dandelion blossom by the green end dip in batter and place in the deep fryer careful not to crowd the dandelions as they fry. Fry until golden brown and put in a bowl lined with paper towels. When I read about Sarah's blogging event Tastes to Remember, my Grama's Dandelions immediately came to mind. Thank you for bringing back that long forgotten memory. beautiful memory you shared, michelle. my uncle made dandelion wine, and the greens, when they were young and tender (so not so bitter) went into salads or soups. Great memory Michelle ! I did not know you could eat the flower heads. WOnderful memory! Oh and I am jealous of you range. I am in the market for a 36" or 48"dual fuel range and am torn on what to get! i feel so naive but i didn't know you could eat dandelions! cool recipe. Thanks everyone for the kind comments. I had a great time harvesting the dandelion blossoms. No problem at all with quantities, oury yard has many!! Dive, most people do not realize the amount of edible food growing right on their own property and I'm not talking about vegetable gardens. Check in every few weeks, I'm going to be posting as much "Yard Bounty" as I can this summer. I've always wondered what dandelion wine tasted like--and would love to try those dandelion blossoms! (I'm afraid in my neighbourhood, I wouldn't dare pick them for fear of airborne pesticides!). Lovely story--and your dogs (and pups) are gorgeous! Those really are beautiful. Thanks for sharing the story. Just the other day I was talking to my grandmother about eating dandelion greens in salads. Now I'll really have to try it.